This version of the Equilibrium open stairs shares the 'off set' support design but with subtle differences in how the steps are fixed to the structure. With more of the metal structure exposed this is a more contemporary design but maintains its sense of luxury and elegance. 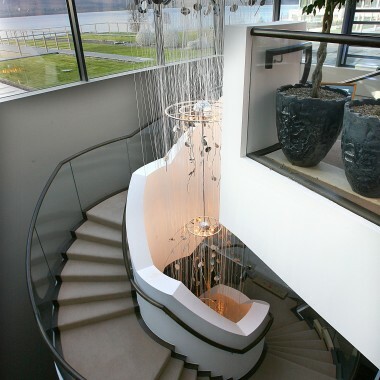 Similar in design to the Cantilever stairs the 'Equilibrium' gives the effect of the open rise, almost floating step but without the structural demands on the adjoining walls. You will see from the other projects in the gallery the supports for the stairs can either be on the 'outside' or 'off-set' and partially concealed within the steps themselves. The 'off-set' stringer is where the support for the step is partially concealed within the timber clad steps. In this case the structure was primed grey and would later be finished by the client to match the interior colour scheme of the house. The 'off-set' option has a limit of approx. 12 steps in a continuous length which makes it most suited to a 'dog-leg' or 'return' stairs construction as in the first two images in the gallery. The 'outside' profile cut stringer is an alternative option available in the Equilibrium open stairs range. Here the steps are finished inside the stringers and the glass balustrade is fixed to the stairs with brushed finish decorative stainless fixings. This version of the Equilibrium is more suited to a 14 step straight run stairs layout. In this project the house had four levels and the Equilibrium open staircase was used with stunning effect to link the areas of the house together. 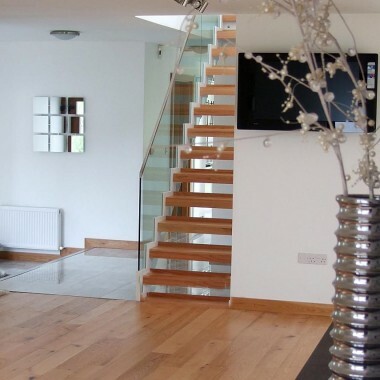 The stark contrast between the dark walnut finish and otherwise white interior colour scheme ensured this stairs is a stand out feature of the home. The glass balustrade contributes significantly to the open plan design of the main living space of the house. This picture highlights the expertly finished steps and fixing detail of the glass balustrade. This type of stairs construction gives the illusion that the glass is sliced into the solid steps. The clear toughened glass balustrade is finished with a rebated solid handrail which is fixed directly onto the edge of the glass. The sense of openness and light from this open stairs design is continued onto the first floor level with the use of frameless guard railings to the stairwell & gallery areas. The unimpeded view through the glass ensures a maximum sense of space is gained while there are no awkward linear shadows cast as would be the case if traditional post and spindle railings were used in the stairs construction. This photograph illustrates just one of the many subtle details which set our stairs and service apart from others. 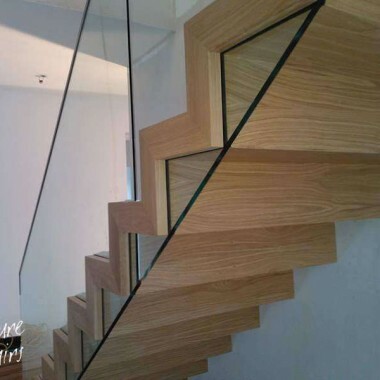 Glass heights are gently changed to ensure handrails run seamlessly and continuously along the length of the stairs without any clumsy corners or potential 'pinch points' in the stairs construction. The profile cut stringer with offset option gives this staircase a distinctive design that demands attention. With a contemporary style, open rise stairs with ‘free standing glass’ balustrade generate an immense sense of openness & luxury. The solid mild steel structure of the open stairs can be customised by clients to integrate the stairs colour within the overall interior design plan for the home. The profile cut stringers can be to the outside of the stairs or alternatively off-set slightly in from the edges. The visible mild steel structure is delivered, filled, sanded and primed ready to take finish colour by client, ensuring that the stairs can be fully integrated into the interior design scheme of your home. 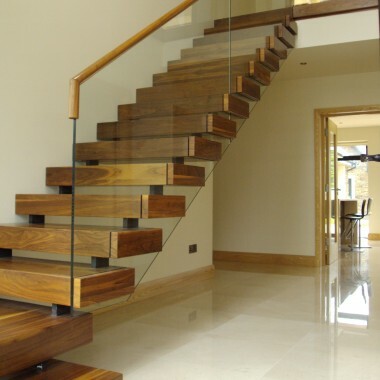 Steps have open rises with options of either a thinner step with glass risers or a heavier block type step. In the case of the off-set version of the stairs, steps will be finished with timber plates to the outside of the glass balustrade. The Equilibrium open stairs is particularly suited to a straight flight stairs and is available in the timber of choice.